Well, friends, I’m always a little nervous to push “publish” on income report days, but today I was even more nervous than usual. And there is a reason for that. Donnie and I have decided that this will be the last income report here on Just a Girl and Her Blog. When we started doing these reports nearly 3 years ago, we did it because we looked around and noticed that the only income reports out there were from people making a huge amount of money from their blogs. We weren’t. In fact, I think the first month that we published an income report was the first month we had ever cracked the $1000 mark. Donnie was still working a corporate job, and the blog wasn’t making anywhere close to a full time income. But we had big dreams. We hoped that maybe one day our little blog would be able to become our family’s full time business. 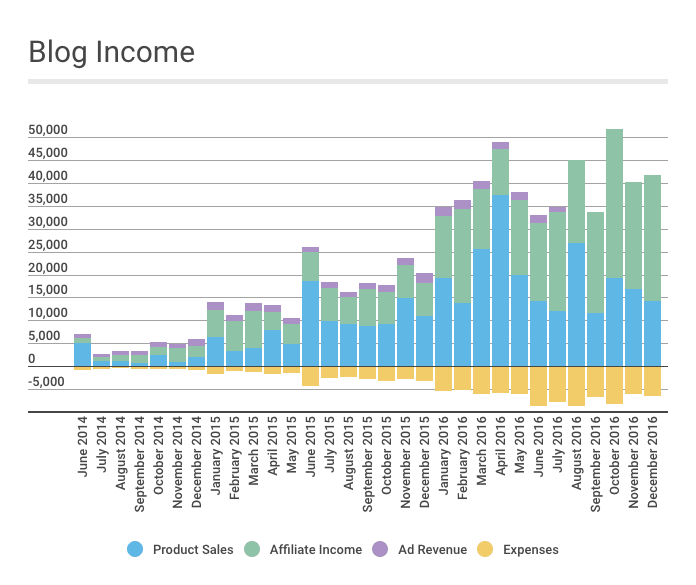 And we thought that by publishing income reports, we could document all of the strategies we tried and things we did to help grow our once hobby blog into a full time business, and in the process, help other people who were trying to do the same thing. Over the course of the past 3 years, we have seen our little blog project grow more than I think either Donnie or I had ever imagined, and we feel so overwhelmingly grateful for that. But as it grew, and particularly within the most recent months, the income reports began to feel a little bit “icky” to us. (This is totally not a judgement on others’ income reports. There are many legitimate reasons to publish them. We just feel like our own reasons don’t quite hold up anymore.) 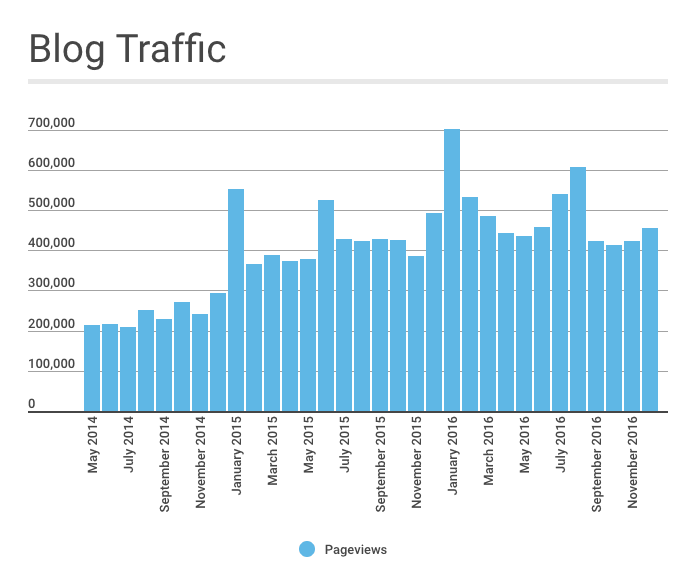 It began to feel more like every month we were showing off how much money we made (which was not our intention AT ALL), rather than giving actionable strategies that could help other bloggers grow their sites. When we started to feel this way about the reports, we tried changing the format, putting a “teaching moment” or lesson that we had learned that month at the forefront and just kind of tacking the numbers on to the end of it. And we felt a little better about that, but for both of us, our gut kind of kept telling us that it was time to end the reports. After all, they’ve done what we set out to do: they did document our growth over three years of working as hard as we could to build a blog and business, sharing what worked and what didn’t along the way. And I hope that people who want to learn about growing their own blogs will still be able to look back at the previous reports and find some relevant information that will help them grow their sites. Because that has always been the point. We’ve always wanted to use what we’ve learned to help others with similar goals. We still do. We’re just going to change the format a little bit a lot. Instead of our one blogging post each month centering around an income report, we’ve decided that each month we will run a type of “experiment” on our own site and share the results with you. The income reports tended to focus on things that were successful for us. With these experiments, we really want to work on the things that we’re kind of terrible at! Maybe one month we’ll focus on trying to drive traffic from Facebook (something we’re not doing well at all currently). Maybe we’ll focus on getting more organized with our editorial calendar or trying new ways of driving traffic rather than just relying on Pinterest and Google (other areas where we could definitely improve). Now that we’ve been at this a while, it’s easy to get into a rut and just keep doing what we’ve always done. We want to challenge ourselves to break out of those old routines and keep striving to get better in many different areas. We’re hopeful that these experiments will help us do that, and that the lessons we learn and share will be helpful for others as well. We also want to hear from you! What are some areas of blogging that would be helpful for us to experiment with? Let us know in the comments! We are definitely open to ideas because we want this new series to be helpful to YOU, dear readers. Your input is really important to us! If you had to go back and start your blog all over again, what would you do differently? 1. 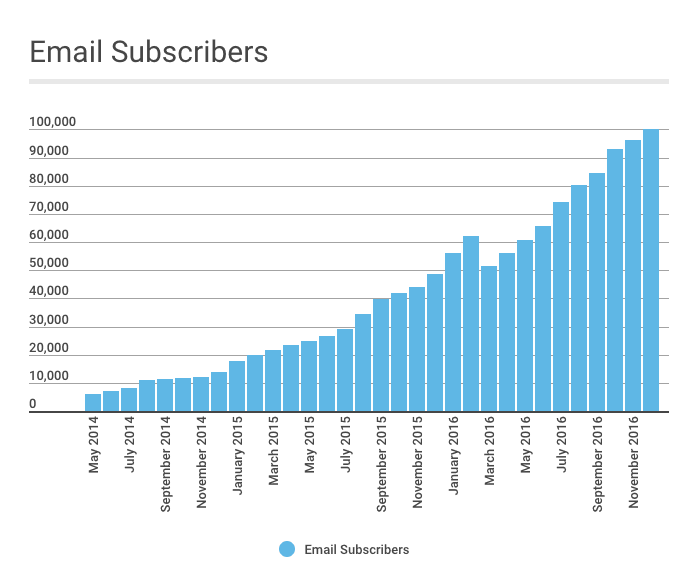 I would have started growing my email list sooner. This is the first answer I always give when I’m asked this question. 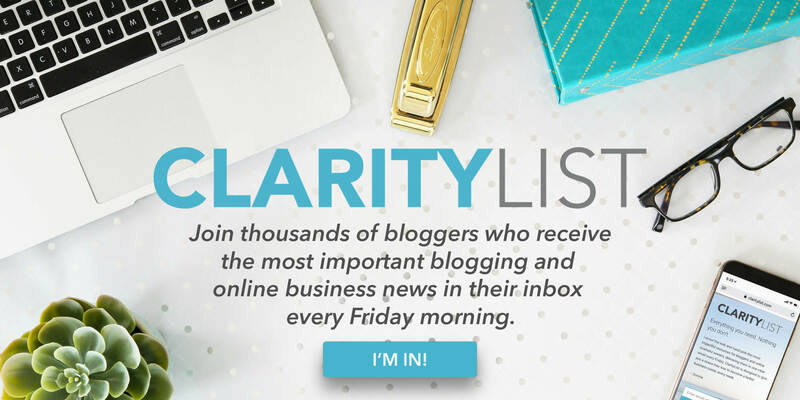 Even though I had heard a lot of “big bloggers” talk about the importance of “the list,” even though Donnie encouraged me to grow my email list from day 1, I didn’t listen. I was busy, I was caught up doing other things, and I didn’t understand just how important it was, so I waited about a year before I started to grow my email list. Our email list has become one of the biggest if not THE biggest contributor to our business’s success, and if I had started growing it earlier, it would be even bigger than it is today. Our email list allows us to keep in touch with our followers more easily and get to know them better. It has helped us to sell more products and grow our traffic. Without it, I don’t know that we would have been able to make the leap to both Donnie and I blogging full time, and we are so grateful to our subscribers for following along on our journey. I think that the email list is so important that if you have to skip a blog post or two in order to make the time to get it set up, it is more than worth it. If you haven’t started yet, learn from my #1 mistake and make 2017 the year you really focus on growing that list. 2. I would have had more confidence in my abilities. This is something I still struggle with, but I know it’s something I can control and am working to get better at. I am so thankful that I had Donnie to be my biggest cheerleader, to encourage me every step of the way, and to push me out of my comfort zone. Without him practically dragging me along, I never would have had enough confidence in myself to pursue writing eBooks and creating products. I never would have reached out to brands or fellow bloggers I admired. I still don’t do a lot of those things as often as I probably should, mostly because I let fear hold me back. If there is one thing blogging has taught me and continues to teach me, though, it is that it’s not just “special” people or super smart or uber talented people who can do big things and affect peoples’ lives for the better. I am capable of that– normal, ordinary me. YOU are capable of that. And just as I continue to battle with overcoming fear, I encourage you to try to face it head on as well, and just GO FOR IT. 3. I would have chosen a different blog name. This is mostly just semantics and is not the end of the world, but if I were to go back to the beginning and do it again, I would have chosen a different blog name. Not only is there an absolutely incredible home decor blog out there with a very similar name that I wasn’t aware of at the time (sorry Chris! ), but now that Donnie and I really blog as a team, the name “Just a Girl and Her Blog” doesn’t really fit. I don’t think it negatively affects our business and it would be a lot of work to change it at this point, so we will probably leave it alone, but if I was starting from scratch knowing what I know now, I would have done more research and chosen something else. Along with those things I would have changed, though, there are two things that I didn’t do “by the book” that I would keep exactly the same. 1. I’m glad I took my time finding my niche. Everything I read about blogging says to pick one specific niche and stick to it in order to see the fastest growth possible. But the truth is, if I would have chosen one thing from the beginning and stuck to only that, my blog probably wouldn’t have taken off and I may not even be blogging anymore. Even if it means that it took me a little longer to grow my site, I’m glad I went through that learning experience and tried a bunch of different things in the beginning. 2. I’m glad I work with my husband (and my sister). Things definitely aren’t perfect all the time and we have our share of disagreements (okay, it’s mostly Brittany and me picking on Donnie 😉 ), but I wouldn’t trade it for the world! So that’s my little reflection about the last four years. So much has changed in blogging since I first started, and I’m excited to see what all will happen in the next four years ahead! Friends, I truly hope you know how much it means to us that you have stuck with us through all this time! We could not do this whole blogging thing without you, and we are so grateful to you for making it possible. Thank you, thank you, thank you for being your awesome selves! We look forward to the changes that the future brings, and we hope you’ll come along for the ride! We’re looking forward to the change! We hope it will be super helpful! 🙂 Congrats on your 4 year blog anniversary! I’ll miss your comprehensive income reports. Keep up the good work! Sooooo love that you followed your gut feelings to stop the Income Reports. Your explanation makes perfect sense, you Show Offs! LOL! Happy for you and all of your success and really look forward to the “experiments” to come! Thank you as always for all the ideas and inspiration. Lol! Thanks so much, Katie! Looking forward to the change! 🙂 Hope you’re having an awesome week! Congratulations from me as well Abby & Donnie! You both have been so forthcoming with your information, that it gives me tons of inspiration that I can also do a blog, and make some kind of an income. You give us all free information that is invaluable. The fact that you have done these income reports has been extremely brave in my opinion, and we all thank you. But you need to move forward in the manner that works best for you, and I will still be following you right along! Take care, and again THANK YOU! Just discovered your blog and I’ve spent hours reading your posts. I just started a blog of my own and am such a newbie! You give such amazing advice and thank you so much for sharing what you’ve done that has or hasn’t worked well. I will probably continue to read hours more of your posts! Congrats on how far you’ve come!! Such an inspiration!! You’re the sweetest! Thanks so much for stopping by and for your encouragement! Hope you’re having an awesome week! I really have appreciated seeing your income reports. I started blogging about six months ago and I have yet to make a single dime, but your reports help me to see what is possible. How long after you first started blogging did it take for you to make a profit? I feel like I am working so hard but getting nothing in return so far. My goal is to eventually be able to quit my job and blog full time. Like you, I decided to stop publishing my reports this year. I’m struggling internally about sharing my income and have been trying to think of how I could share monthly reflections moving forward without discussing money. I am SO excited to see what y’all decide to do each month instead! I think what you are doing is AMAZING and can’t wait to see how your 2017 treats you! You made my week, Kristin! That’s SO awesome! Congrats on your amazing success! Looking forward the experiments coming up. Have a wonderful week! I’m sure Donnie can find other information to put in chart form, ha! I’m always super impressed with the details in these reports, but totally understand. I think you’ll get some good feedback from discussing experiments and it will help others too- sounds like a great idea. Appreciate your willingness to share and always being so positive! Lol! You know him too well! 🙂 Thanks so much, Misty! Have a wonderful weekend! I’ve loved your Income reports as they’ve provided a ton of encouragement for me to see the possibilities. However, following your inner tuition is always the best policy. Good for you for making this decision. I’m really looking forward to the new format. You both always do everything well so I’m sure this will be no exception! As much as I love reading your income reports, all respect for your decision, and super excited the new monthly experiment series. I’m sure, there’ll be tons of value in there too for us noobs. Lol! We are looking forward to it too, Hena! Thanks so much for your encouragement! 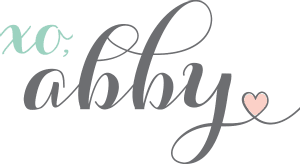 Abby, I have really enjoyed reading your income reports, and am grateful for the resources they provide, and I think I’m equally excited about your plans going forward! My husband was “downsized” out of his job last September and we are seriously considering investing his time and our money into my blog to grow the business to support our family. You and Donnie are an inspiration; I’ve given my new “employee” an assignment to read your blog as part of his training. 😉 Have a great week! Lol! You are too sweet, Kim! It is definitely a scary adventure but has been such a blessing as well! Sometimes seeing income reports can feel very intimidating to me since my blog is my “side hustle” and not making an income (yet!) Thanks for your honesty and sharing your mistakes and successes. You guys are a great team! I really enjoy your income reports. It provided ideas for where to get income from your blog. But also I can understand why you are letting it go. Just continue to be inspiring as you always have been. Because really you have pretty much been my inspiration. You are too sweet, Barbara! Thank you! I hope our reports going forward will be beneficial to you! I am a very new to blogging. Your site and tips have been very beneficial. I noticed that you do not list Google AdSense under Affiliate Income. I am assuming you don’t use them and I wonder why. I apologize if you already blogged about the reason. Thanks so much! Hi, Lisa! We have used them in the past but we actually removed all the ads from our site this past summer. You can read more about it in the post: https://justagirlandherblog.com/october-2016-income-report/. Have a great day! Your story is inspirational. Thank you for posting this. Congrats on all of your success! Thanks so much, Shari! Hope you’re having an awesome week! 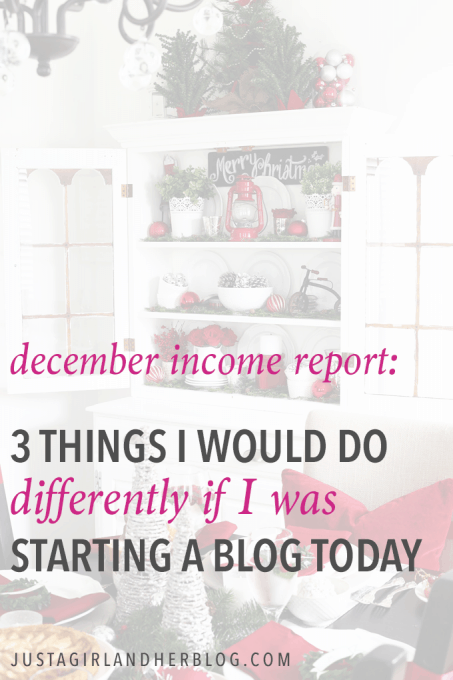 I just recently found your blog and think you income reports are inspiring! In no way did you guys come off as bragging to me at least. I think your willingness to be open and honest with the intent to help others with there success is refreshing. Thank you for all of your help, I hope to have my own blog up and running soon. I couldn’t have done it without referencing your sites! I appreciate how you share what you’re spending money on in your blogging business. What apps and services you’re using. Could you do that now and then, even if you don’t mention what it’s costing you? It’s been great as a beginner to know what more established bloggers use in their business. I was beginning to doubt that people could make a living blogging until I heard you speak at Haven. I came home and immediately checked out your website. I was thrilled! Your income report gave me hope (and convinced my husband) to continue this blogging adventure and proof that it could be a business not just a hobby. Thank you for sharing your reports because they have provided insight and direction. I have much to learn so I study them to see what I need to work on next. I’m even taking a Maria Cuz course because I saw that you were a “testimonial” for one of her courses. Without sounding to gushy, you and your husband are an inspiration and an encouragement for spouses who want to work together. Thank you!!!! You just made my morning! You are too sweet, Sandy! So glad our blog has been so helpful for you and your hubby! Love to hear that. Have a wonderful weekend! I’m a fairly new reader of your blog—I love your style and how generous you are with information of all types. I’m working on starting up a home remodeling/design blog this year and was wondering whether the expenses for remodeling projects in your own home are tax deductible in any way? Thanks! For us, generally no. Every situation is different. We’re always checking with our CPA on these issues. I found your blog on Pinterest when I searched “How to make money Blogging”, and I’m so glad I did! I recently made the move to a self-hosted WordPress account to try and grow my Travel & Lifestyle blog, and it’s the best thing I’ve done in a long time! I love that you share this information with people. ITs really motivating and inspiring, and I don’t see any negatives about it whatsoever. I’m devastated I only just found your blog, because I would have loved to have been on this journey with you! Thanks so much, Sarah! Looking forward to the change! 🙂 Have a wonderful weekend! Oooh, how exciting! The new idea sounds great, I think I’ll really like that! I enjoyed the income reports too but to be honest sometimes seeing income as high as yours (and some other bloggers I follow) it just feels discouraging to those of us who are NOT earning that kind of money. I think the experiments will be really helpful. Just out of curiosity have you ever talked about the importance (or non-importance) of responding to your readers’ comments? I notice that you respond to most, if not all, comments and I’m wondering how you feel about that. There are some other “big” bloggers who I love their content but they NEVER. EVER. respond… ever… not even to questions and I find it incredibly rude to the point of unsubscribing. I understand that as your blog grows it becomes harder to respond but I feel that it is very important. Just wondering how you feel about it and how you manage to do it. I just want to personally thank both you and Donnie for publishing your income reports. I was a SAHM for 12 years, stuck in the rut of day to day monotony when I stumbled onto your income reports on Pinterest at the end of 2015. I had always wanted to start a blog, but I thought they were just mainly hobbies and I didn’t want to devote that much time & effort (I had become VERY lazy…ugh.) But when I saw your blog and realized how much $$ potential there was, it gave me the push and motivation to actually get my act together and DO something! Just wanted to say that while I totally respect your reasons for discontinuing the income reports, I’m grateful you published them while you did, because they were a big motivator for me to start my own blog. When I looked at what you were doing I thought: I can do this too, and if I’m even half as successful as Abby, it will be worth it! So thank you for that! I have followed you over the last three years with great pleasure! I have really enjoyed how you have freely shared your income reports, especially how you split everything up so comprehensively. It has been a great pleasure for me. I am an artist and have spent three years trying to decide what sort of blog to make! Time well wasted! Better make one on procrastination! I love the affiliates idea! Thank you guys for giving so much of your ideas over the three years! Thanks so much for following along! So glad they have been helpful for you! It can definitely be challenging to narrow down your topic and find your niche, but you can also become more focused as you go. I definitely did! Have a wonderful week, Nicolette! Hi Abby! I am very excited to see how your experiments go. I just started out a few months ago and everything I’m doing is an experiment right now. 🙂 Still trying to figure what will work for me to grow my email list. Building a Framework and your blog have been so helpful and such an encouragement for me. Thank you for sharing in such a kind and encouraging way. You have a good heart, girl! Oh I am going to miss them, they are truly enlightening when you consider most traditional businesses keep these inner workings confidential. But I understand what you mean by the ‘icky’ factor especially when your audience is mostly new bloggers. I would guess though that these posts in and of themselves are a source of traffic and affiliate income, so I do wonder what the impact will be down the road? It will be interesting to see, but I am really enjoying your open and honest sharing of your blogging journey into a business, it’s such a wonderful resource and source of inspiration! Just curious, will you be removing the actual Income Report Posts from your site altogether, or just not publishing future ones? The old income reports will still be on the site. We just won’t be posting new ones! Good question! 🙂 Have a wonderful week! Aw, you’re too sweet, Janett! Thank you! I’m looking forward to the change, as well! Hope you’re having a great week! Thanks so much! I probably work around 40 hours a week these days (I worked 50+ the first two years of the blog), but my husband works full-time on the blog, as well. We also have an assistant who works about 15 hours/week. Hope this helps! You are simply crushing it, Abby. I’ve recently started following your blog. I have my own too, that I just started and I’m already planning a relaunch. I think that your reasoning for stopping income reports is very understandable and well thought out. You are inspirational, to say the least. I hope that my blog will eventually be successful as well. One question I am curious about and I hope that you answer. Did you take EBA? So nice to “meet” you, Natasha! I always love running into other ‘Burgh-ers! Thank you so much for your sweet words! I did not take EBA. I’m more of a “run experiments to figure out what works for you” type of girl, lol. Best of luck with your blog! Hi Abby! I love your blog! I love how you said in this post that you don’t reach out to brands and other bloggers as often as you should. I can totally relate to that in starting my VA business. Sometimes allowing the fear to hold me back. It is nice to know I am not alone. 🙂 Thank you! It can definitely be scary, but also so worth it! 🙂 Have a great week, Lindsey! Wonderful post! I say “If it Ain’t Broken, Don’t Fix It”. I am referring to your blog name, don’t be so hard on yourself. Everyone had to start somewhere and justagirlandherblog is not a lie, it just gives all those girls or guys out there a reason to start their own blog, especially when they have no one else but themselves. Awesome income report. It’s great to know that you went from 10k subs to 100k in just 2 years. What do you think let to such a huge growth? You can read our blogging story here: https://justagirlandherblog.com/blogging-story/ but it was definitely our digital products that took our business to the next level. Thanks, Rohit! Thank you for posting your income reports and I understand why you’re stopping. I am just getting started blogging and your numbers and your heartfelt words are encouraging. Wow, this is incredible! I just launched my blog two weeks ago and it’s very cool to see the potential. Personally I am fascinated every month in the income report, and I wonder if you can rethink doing it and instead of making it a big published article, maybe you could just make it a link that we can click on that takes us to a page that has the report in a basic form only? That way, it is not bragging and people like me can still get my fix! I personally love to see what is making you money and it gives me ideas for things to possibly try to include in the blog I am starting. You rock! I love checking out your blog! I am shooting for April 1st to hit the publish button on my blog! Thanks for all the help and advice you give on your site! Hi, Sonia! We won’t be doing them anymore for now, but who knows… Maybe someday we’ll continue! 🙂 Glad they have been so helpful for you! Hey Guys, Stacey here. Just want to say thank you for sharing your income reports. I understand your reasons for not wanting to show them anymore. I would ask that Donnie still keep us up to date on what worked and what didn’t each month. There are a lot of useful morsels in the reports that we can apply to our own blogs. I was truly impressed and motivated to see a huge chunk of your income came from your own products. Way to go guys. Maybe you will offer a course in the future on how to create a course???? Just a thought. Thanks for the inspiration and guidance, I am just starting Building a Framework and am absolutely giddy! Hi, Stacey! So glad they’ve been helpful for you! We actually do have a course that teaches you how to create your own product. It is called Book Boss and you can find it here: https://courses.buildingaframework.com/. Thanks and have a wonderful day! This post has been so inspirational to me! I’ve actually started by own blog 2 weeks ago strongly because of this post and seeing the possibility of earning a passive income through writing something you care and value about. Thank you for showing a newbie blogger his way! I’m a new blogger and I would like to help my friend start a blog as well. She’s not really computer savvy and worries it’s too hard. Do you have any advice? Thanks for sharing your income report.You are an inspiration to the new blogger like us. Once again thanks for sharing it. Hey there! I just read this post. In it, you wrote that you wish in hindsight that you changed your blog name. I want you to know as a reader, I think it’s catchy, even if your husband works on it with you now. As a reader, I was just texting my friend about your blog and said, “Look at this income report.” (Because I am building my blog and was researching this, so I am glad you shared it with us.) Anyhow, I said, “Look at this income report. Just a girl and her blog. Like literally. Her blog is called ‘Just a girl and her blog. '” It was easy to remember and for both of us to find. Keep up the great work. I especially liked the part where you say what you would do in hindsight with getting your blog off the ground and running. The email list was the last thing on my list, and now it will be bumped up to a priority. Thanks for sharing your wealth of wisdom! So glad it was helpful for you, Heather! I agree the name is catchy. It is just similar to another blogger’s name so I wish I would have known to consider that back then! 🙂 Hope you’re having a great week! I just wanted to say thank you. I’m just starting my blog, and got your book on my Kindle. It had so much great information on it, I wanted to say thank you. I am in the early stages of creating my blog, so your information really helps. Thanks for sharing your wisdom with a the newbies! This was very helpful to read. I like that you’re taking a different approach to the income report. It’s helpful to know that even though your successful financial with your blog, you’re highlighting the areas of improvement. Those areas that you need to improve on are the same things I’m trying to improve on with my blog. So it’s nice to follow along. Thanks for being so opening. I’m focus on gaining traffic to my blog before monetizing it. Focusing on Monetizing was distracting me from creating good content. So glad they were helpful for you, Nicky! Love to hear that. And yes… CONTENT IS KING! You are right to focus on that first. Wishing you the best! very inspirational for beginner blogger like me.. I have been reading several posts on your blog (specifically about the blogging business). I want to thank you! Your posts (especially the income reports) have been very encouraging for me. After losing all of my blogging content (2 years worth of work) thru a hosting switch that didn’t go well, I was discouraged and considered giving up. I wasn’t making much from the blog or digital products (even though I have a lot of them). I am in the process of converting from a freelancing income into blogging. I have been looking for strategies to wean myself from freelancing into blogging, and your experiments have sparked some creativity in me.. I am hoping to accomplish this goal by January 2019. Thanks for the encouragement! Thanks for the great info Abby. just recently discover your blog and I will be back for more. I have just started my blog this past year and have learned a lot. I don’t have a cheerleader like you have so I have to rely on inspirational posts like yours to keep me going. Just starting to make a few dollars but have a long way to go. So glad it was helpful for you, Pete! Wishing you the best on your blogging journey! It’s nice to see your income reports and inspiring me to work more hard and smartly to get there. It is so helpful for bloggers like us. And one thing that I think your blog name is good, don’t be regret. Thank you for sharing your income report with us! This post is really inspiring me to go stronger, although I’m at the binning. Thank you for sharing also your story behind the income. Hi Abby! 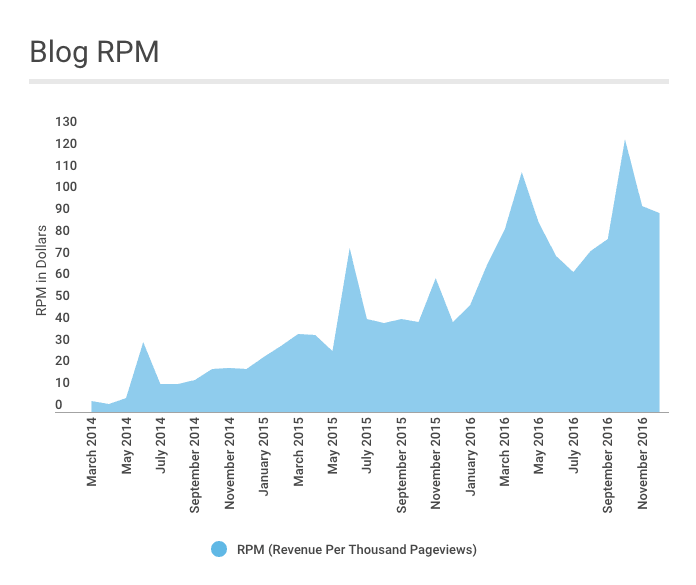 We included your income and traffic report in a couple charts comparing a variety of different blogs. Thought you might think it was interesting. Nice to see your so honest suggestions. I would like to take your input on my blog, I have started with a blog where I put motivation and inspirational content.It’s a 3 months old blog and I have kept the domain name as interestinginputs.com. As I used to read a lot of articles daily on blogging and choosing domain name, I am little confuse about my domain name. I see lot of articles talks about keeping the domain name short upto 15 characters. What do you suggest shall I change my domain name or can keep it as it is. How my domain name sounds to you at first place? Hi, Swati! I think your domain name is a fine length. As long as you’re putting out high quality content that is serving your readers and meeting their needs, you’ll be on the right track! I was wondering… do you make money from your you tube channel? I know these are old income reports but I was just curious? Hi, Nicole! We make a little bit from the ads on our YouTube videos, and also if we have a brand sponsor a video, we make money from that. I hope this helps! Have a great day!